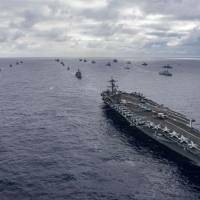 NEW YORK - The vast annual military operation known as the Rim of the Pacific Exercise (simply RIMPAC in Pentagon jargon) just concluded on the beaches of Southern California with a huge demonstration of an amphibious assault, which involves sending troops ashore from warships at sea — a highly complex maneuver whether D-Day or present day. 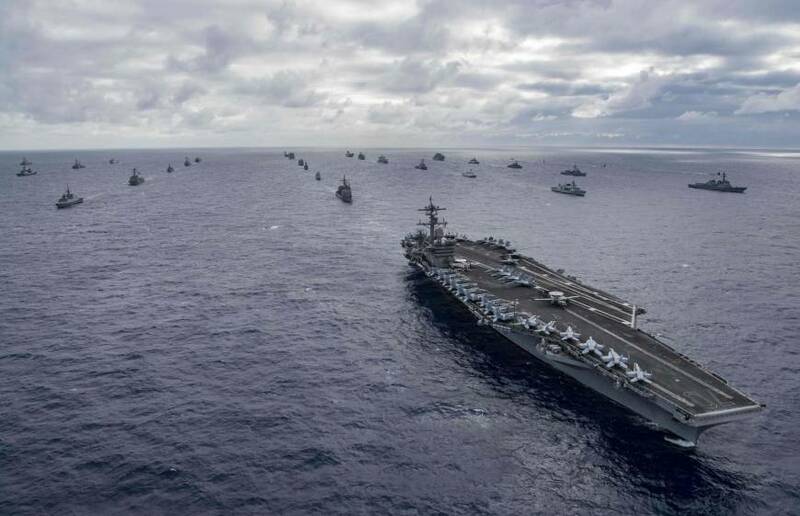 The exercise is held every two years all over the Pacific Basin, and is the largest international maritime exercise in the world. It is globally regarded by naval officers as the Olympic Games of naval power. Run by the U.S. Pacific Fleet, which is headquartered in Pearl Harbor, it normally includes warships and troops from every branch of the U.S. armed forces, and those of than 20 foreign nations. As a junior officer, I participated in several of these huge war games, and found them profoundly important for national security. They have been held since the early 1970s, and include nations not only from the Western Pacific rim — Japan, South Korea, Australia, New Zealand, Brunei, Vietnam, Thailand, Singapore and so on — but also from the Pacific coast of South America, including Mexico, Peru, Chile and Colombia. India, an emerging maritime power, had a significant operational role for the first time this year. Several European allies with interests in the Pacific, including the United Kingdom, France and Germany, also send ships. Israel sends a small staff contingent. Some wags would say that the most important business is done at the big cocktail parties, and that the most dangerous moments are the photo shoots at sea (where the huge fleets come together undertaking very precise and scary formations, with the added degree-of-difficulty of challenging language barriers). But in truth, RIMPAC is an incredibly important opportunity for allies together to practice complex maneuvers: amphibious landings, long-range aircraft strikes, counterpiracy, antisubmarine warfare, counterterrorism, anti-air missile shoots and humanitarian responses to large natural disasters. It is also, above all, a visible signal of the most important militaries of the vast Pacific Basin being willing to share training, tactics and technology. With some 50 ships from a couple of dozen nations sharing and learning from each other, the opportunities to improve warfighting capability are rich. We are able to exercise our powerful tactical ballistic-missile submarines, which can launch Tomahawk missiles. And through exercises like this we can also find the best way to operate our new Littoral Combat Ships — frigate-sized warships capable of working in relatively shallow seas — in tight regional conflict. But this year, in a break with recent tradition, China was “disinvited” in May because of its militarization of a variety of artificial islands in the volatile South China sea, where it is sending troops and setting up combat-aircraft, runways and missile systems. There was also a distinct undercurrent of opposition to China’s presence by the Donald Trump administration, which sensibly criticizes Beijing for trade practices and theft of intellectual property. While I’ve repeatedly criticized Trump for his dealings with allies and foes, cutting Beijing “out of the pattern” this year was the right decision. It deprived China of not only the chance to observe and learn about allied naval practices, but also of the prestige of engaging with the top navies in the world. The increasing involvement of India — the obvious strategic counterweight to China — as well as this year’s addition of Vietnam — a growing naval actor deeply concerned about Chinese dominance in the South China Sea — sends a powerful signal. All of this underlines how important military exercises are to our ability project power; maintain sea control (and therefore ensure shipping lanes around the world remain open); and exert influence on allies, friends and partners. It also shows why Trump’s decision to stop U.S. military exercises with South Korea — in return for a few vague promises from North Korea — is a bad idea. First, they provide a strategic context to our overall policies in a given region, and no region is probably more critical than the Western Pacific. This is all the more vital because the Trump administration made a significant mistake by pulling out of the Trans-Pacific Partnership. Leaving aside the economic issues attendant to that call, it was a major geopolitical foot fault. We can mitigate some of the damage that decision inflicted on our leadership role in the region by conducting robust, meaningful exercises like RIMPAC — while excluding China. Second, warfighting “practice sessions” give us real insight into not just allied military capabilities, but also those of adversaries. They help reveal the surveillance and intelligence-gathering abilities of opponents like China: how capable they are and what their evaluation of us is all about. That is prime-grade intelligence. Third and finally, RIMPAC is a “carrot” that over time may be applied to China. If we are to avoid the Thucydides Trap, which holds that war between the dominant power and a rising rival is inevitable — we will need a strategy over time to offer China opportunities to be included in meaningful security cooperation. Perhaps we missed such a chance with Russia at the end of the Cold War, possibly leading to Russian President Vladimir Putin’s adventurism today. If we can dissuade Beijing from continuing unacceptable behavior in cyber, the South China Sea and intellectual property theft, the situation may become less fraught in the long throw. Overall, this year’s exercises were a resounding strategic success, and a tactical treasure trove of information. We should continue to exclude China, hold our opponents close, add new partners, and make inclusion in RIMPAC something that Beijing so wants to be part of it will change its ways. James Stavridis is a Bloomberg Opinion columnist. He is a retired U.S. Navy admiral.